“American Sniper” has become a huge hit, a multiple Oscar nominee, and the topic of much conversation this winter. 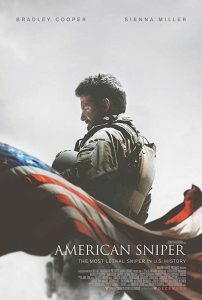 Clint Eastwood has brought the true story of Chris Kyle, Navy SEAL and much decorated sniper in Iraq, to the screen. After serving four tours of duty in Iraq, Kyle was shot on a shooting range back at home by a mentally unstable veteran he was trying to help in 2013. A bulked-up Bradley Cooper plays Kyle, a Texan who loves his guns. In an early scene, Kyle’s father tells Chris and his brother that there are three kinds of people in the world: wolves, sheep, and sheepdogs. It is the job of the sheepdog to protect the sheep from the evil wolves. Chris’ father makes it clear in no uncertain terms that he wants his sons to be sheepdogs, and never sheep. It’s a black and white world view, with little room for gray. Mr. Kyle teaches Chris and his brother to shoot and hunt at a young age. Chris becomes an excellent marksman and hunter. After witnessing the 9/11 attacks on television, Chris volunteers with the Navy, saying that he wants to protect his country. Noticing Chris’ size and physique, the recruiter suggests that Chris train for the SEALs. Chris does so and graduates from the rigorous SEAL training. Using his skills as a marksman, he becomes an accomplished sniper in Iraq. While training as a SEAL, Chris meets Taya, (Sienna Miller) a lovely woman at a bar. They marry before Chris is shipped off for his first tour of duty. “American Sniper” divides its time equally between Chris’ duty in Iraq, and furloughs back home with Taya, and, eventually their two children. Chris becomes increasingly more at home in Iraq than Texas. Taya cannot help but notice Chris’ distance from his family when home. She is increasingly upset about this. After his last tour of duty, Chris is affected by PTSD and sees a therapist at a VA. The therapist leads Chris to a group session for wounded warriors. Chris finds his place helping the other veterans in their transition to civilian life, often by taking them shooting. Eastwood directs the action sequences well. We look with Kyle through the crosshairs as he searches for the enemy. He scans civilians and has to wonder and make split decisions. Might a man, woman, or child, be hiding a bomb or other weapon? There’s an excellent sequence in which Kyle’s squad has to evacuate in the midst of a sandstorm so intense they can barely see the hand in front of their faces. Perhaps the most chilling sequence of all is near the end, when Kyle carries a gun around the house, almost like a toy, teasing Taya, with his daughter close by. It’s difficult to imagine any responsible gun owner taking a chance like that. Maybe Eastwood, who has certainly dealt with guns in many movies, was trying to show that Kyle wasn’t as healed as he thought at this point. Bradley Cooper is certainly a gifted actor, as he proved in films like “Silver Linings Playbook,” and he resembles the photographs of Kyle. However his performance is not as nuanced as some of the other Oscar nominees, including Benedict Cumberbatch (“The Imitation Game”) and Eddie Redmayne (“The Theory of Everything”), also playing real-life characters. As you would imagine, there is a good deal of war violence depicted in the movie, although it’s not particularly gruesome. Not surprisingly, there’s also a lot of profanity throughout.